This collection takes us all the way back to the first poem by Heaney most us ever read, which was the first of the first collection, 'Digging'(1966). That poem is concerned with the human chain as it describes his father and grandfather at work on the land, digging potatoes. Heaney finishes "Between my finger and my thumb / The squat pen rests. /I'll dig with it.". In this collection he refers to the "steady-handedness maintained / In books... / ...of Lismore, Kells, Armagh", evoking the skills of the Monks who illuminated them. And this comes out of a childhood memory of fetching water "To turn ink powder into ink" at school (the poem is 'Hermit Songs'). And a final connection: the "much tried pens" of the monks are surely forebears of the squat pen of 'Digging'. 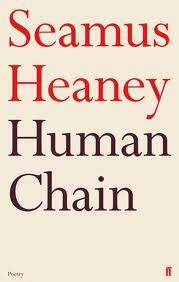 Marvellous the way in which Heaney suggests posterity - his own important link in the chain - without a trace of arrogance. For it is Heaney now who is the old man, not his father or his grandfather ("My hand is cramped from penwork"), and many of the poems in Human Chain are directly about or are concerned with or touch upon, death. Wraiths, ghosts, heavenly air, the dead face of Israel Hands (in Treasure Island), poems in memoriam, Orpheus, wakes, Charon, coffins, war graves, "bodies unglorified" - there is hardly a page on which one is not invited to imagine death or dying or the dead or the afterlife. And through it all runs Lethe or versions of it - rivers - and bits of Virgil, sprinkled like the stones Jews throw into the graves of their loved ones. Which makes this sound gloomy as hell, but of course it is the very reverse of that and as always it is full of wonder and curiosity and sympathy. Heaney is a kind poet. The title poem takes us again back to early Heaney, this time to 'The Barn' in which the boy is threatened by "two-lugged sacks of corn". Now, the ageing poet takes a grip "on two sack corners, / Two packed wads of grain I'd worked to lugs / To give me purchase, ready for the heave". He is part of a chain of aid workers loading a trailer. He describes the "quick unburdening" of the sacks, "A letting go", which turns, in the last line, into a metaphor for mortality. "Air from another life and time and place" begins the last poem in the book, but, like Coleridge's 'This Lime Tree Bower' the poet inhabits memory with poetry, and the air ceases to be "another" and becomes the present air. This, indeed, is what poetry can do: it gives memory a meaning other than its merely narrative one. This is my favourite Heaney collection for some time, maybe because it evokes all those early poems that had a voice in my own childhood. Thoroughly recommended.